240 pages | 23 B/W Illus. Public art is produced and ‘lived’ within multiple, interlaced and contested political, economic, social and cultural-symbolic spheres. This lively collection is a mix of academic and practice-based writings that scrutinise conventional claims on the inclusiveness of public art practice. Contributions examine how various social differences, across class, ethnicity, age, gender, religion, ability and literacy, shape encounters with public art within the ambits of the design, regeneration and everyday experiences of public spaces. The chapters richly draw on case studies from the Global North and South, providing comprehensive insights into the experiences of encountering public art via a variety of scales and realms. 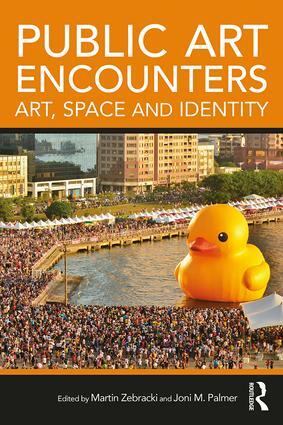 This book advances critical insights of how socially practised public arts articulate and cultivate geographies of social difference through the themes of power (the politics of encountering), affect (the embodied ways of encountering), and diversity (the inclusiveness of encountering). It will appeal to scholars, students and practitioners of cultural geography, the visual arts, urban studies, political studies and anthropology. Martin Zebracki is Lecturer in Critical Human Geography at the University of Leeds, UK. He has written and talked widely at the crossroads of public art, social engagement and (sexual) citizenship. Zebracki is the co-editor of The Everyday Practice of Public Art: Art, Space, and Social Inclusion (with Cameron Cartiere). Joni M. Palmer is an Adjunct Associate Professor in the Department of Geography and Environmental Studies and the Community and Regional Planning Program at the University of New Mexico, USA. Her professional life has covered a blend of practice and academia across arts and cultural planning over the past 25 years.